I have always been fascinated by and in awe of hands. They can hurt or heal, create or destroy- they are capable of so many things. I have long collected photos of hands, and I will often find myself looking at people’s hands when in meetings or standing in line at the grocery store. There are so many stories in people’s hands… I am especially intrigued by the less than “perfect” hands. The ones with little scars that tell a story, the ones with a little dirt underneath the fingernails letting me know they aren’t afraid of a little hard work, the ones that have wrinkles that make me wonder what they created in their lifetime. Having created a lot lately with my hands, first crocheting scarves and other presents for Christmas and now getting back to beading I am reminded how satisfying it is. 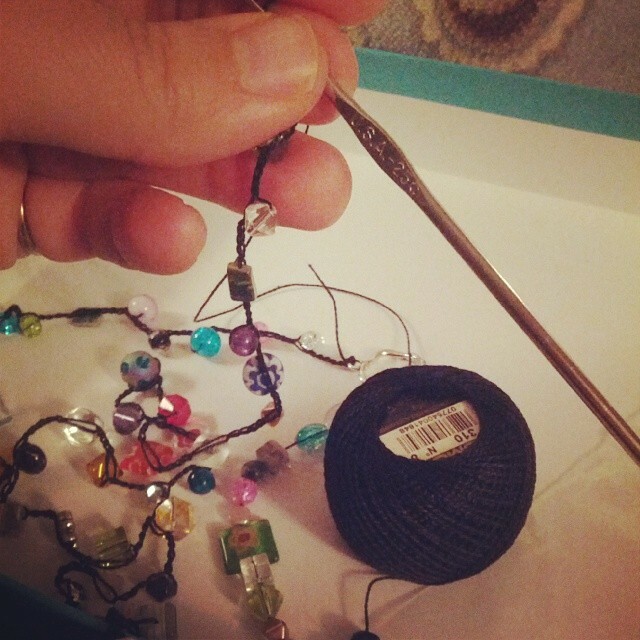 To have a skill- as a result of a story… I remember learning from my grandmother and great aunt how to crochet, sitting for hours in the basement chaining away the length of the basement several times over. There is a pride that is created from holding something in your hands that you have created. But recently I have even been feeling that same sense of pride and excitement from watching others create. I have been enjoying immensely a series called Craft In America. (You can watch the videos here.) It is beyond beautiful and feeds my soul on so many levels. And this little video came to my attention yesterday where they interview Renate Hiller- A World Through The Hands. It seems that I have been reminded at every turn of the value, the gift of creating, of craft, of story, of sharing our own gifts.